HATCHERY FOR STREAMS OF KLAMATH. Fishway Over Copco Dam Found to be Impracticable. New Hatchery in California Will Supply Stock for Streams Here. Copco Nos. 1 and 1-A were constructed by the Company's own forces and under the name of Siskiyou Electric Power and Light Company, was a construction company. At the time of starting construction of Copco No.1 dam, the question of constructing a fish ladder was discussed with interested parties. 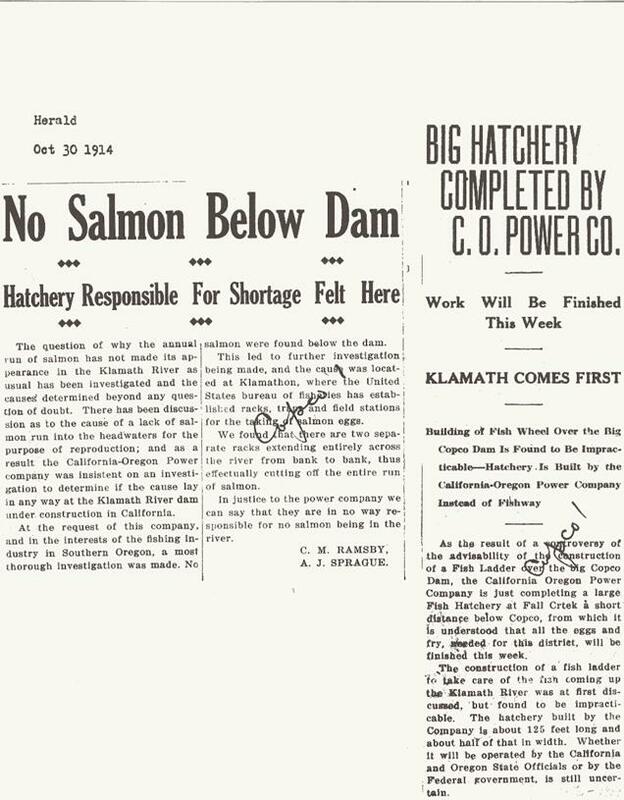 During the initial construction period, representatives of the Klamath Sportsmen's Association, the U.S. Bureau of Indian Affairs, and the California Fish and Game Commission frequented the job and made inquiries as to construction of a fish ladder. The Company was willing to construct a fish ladder over Copco No.1 dam, under the laws existing at the time, providing proper plans and specifications were submitted by the California Fish and Game Commission which would adequately take care of the fish migrations. The Company took the position that it was not willing to construct more than one fishway. The Company agreed with the California Fish and Game Commission, after considerable study, that in lieu of constructing a fish ladder it would build a fish hatchery at Fall Creek, costing approximately the same amount of money as a fish ladder, and deed the land on which the hatchery was located to the State. Also, the Company would rebuild the dams at Klamathon used by the Federal Bureau of Fisheries as an egg taking station. Investigations were made from time to time by members of the Klamath Indian Reservation and the Klamath Sportsmen's Association and, finally, the matter was referred to the District Counsel the Department of the Interior, Office of Indian Affairs, Billings, Montana. “Since your visit to Medford on July 29, 1940 , at which time we discussed the construction and operation of fish ladders and fish hatcheries on the Klamath River , I have had a further search made of our files and records. I have also communicated with men who were associated with our Company during 1918 and 1919, and who are familiar with the Klamath River problems. "Very little information is available from these sources because agreements covering these problems were made over twenty years ago and records have either been destroyed or misplaced. Sportsmen of Klamath County and the whole Coast will be delighted to learn that a plan has been worked out whereby thousands of fish of different varieties will be planted in the streams adjacent to the Klamath Lakes , which will make this section an angler's paradise. For the past three or four years the federal bureau of fisheries has maintained fish racks at Klamathon in California, on the Klamath River, and local sportsmen claim that this has seriously interfered with the run of fish up the Klamath. The idea of a fish ladder over the Copco dam was first taken up and considered in detail, but as a height of some 130 feet would have to be overcome, it was decided from statistics and the opinion of experts, that the installation would not give satisfactory results. Finally the California-Oregon Power Company was taken into the discussion of general plans, and as all the members composing the board of directors of that company are enthusiastic fishermen, there was soon arrived at a plan whereby the federal bureau of fisheries has relinquished all its control of the Klamath River in California to the California State Fish Commission, and has turned over to it the buildings, racks and spawn-taking apparatus. California Oregon Power company has agreed to the erection of a hatchery on its property on Fall Creek, which, on account of the clear and even temperature of the water, a perfect condition is found for hatching and caring for the little fish, and the California Fish Commission agrees to take spawn and hatch various varieties of fish native to the coast streams, and to deliver to the Oregon Fish Commission and the game wardens of Klamath County all the little fish necessary to stock abundantly the numerous lakes, rivers and creeks in the vicinity. The Oregon Fish and Game Commission is particularly pleased, as a much felt want is being supplied without cost, other than transportation, to the people of Oregon and this locality. The commission was represented by the project Engineer H. W. Hincks of the Modoc Point project in this matter. "In answer to the questions in your letter of August 5, 1940 , ...the construction of the fish hatchery at Fall Creek, the construction of the fish racks at Klamathon and the construction of operators' cottages, etc., incidental to the operation of these, was carried on during the last six months of 1918. ...The real estate upon which these structures were built was deeded to the California Fish and Game Commission on March 27, 1919 ."